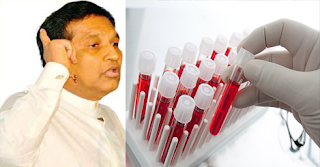 Health minister Mr. Rajitha Senarathne said that, private blood tests for the patients admitted to government hospitals will be banned from this December. Every hospital which has the service of laboratory will be given the machines to do this. He said this in a conference held at the ministry office. This already doing on the service of Colombo General Hospital. Anyway the patients who come to OPD to take treatments may ask for private blood tests, he further explained.